4 p.m. Reflection, Action Planning and Moore! Symposium participants learn about the history of privilege in this country and explore ways to advance equity. With the help of keynote speakers and workshops, we explore issues such as income inequality, disparities in the justice system, barriers to education and employment as impediments to progress. This is not about blame; this is about listening deeply, talking with each other and increasing awareness that leads to the understanding we all desire. All are invited! Your attendance is an investment in the future of our communities, which are enriched by diverse experiences. 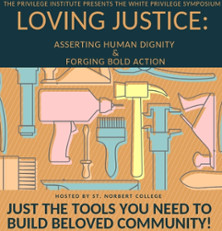 Hosted by The Privilege Institute and St. Norbert College. Featured speakers include the Rev. Dr. Alex Gee, Jackie Battalora, Jenni Monet, Yusef Salaam, & Eddie Moore Jr. Featuring “Edu-tainment” by Jasiri X and MOORE! Connecting Greater Green Bay women leaders + college women students to yak: talk and learn from one another. Featuring a keynote by CVC Resident Scholar Carol Bruess, Ph.D.